I started running with a fun loving group called the Hash House Harriers, which describes itself as a Drinking club with a Running problem. Hashers run in over 150 countries (including India) and have chapters in over 1500 cities â€“ however, the Hashers do not claim to be athletes and are non-competitive short distance amblers, with their main fluid being beer. Over the years, I progressed to running longer distances and have run several marathons and Ultra marathons in India, Europe, and South Africa. Several years ago, on a flight back from Paris, I happened to see a short film featuring the Marathon du Medoc â€“ an amazing run through the beautiful Medoc region near Bordeaux. This is a full marathon (42.2 kilometres) which winds its way through vineyards and some of the regionâ€™s top chateaus â€“ and the refreshment stops serve a variety of fancy foods and of course wine!! Wine stops in a marathon â€“ yes, not one but almost 25 such stopsâ€¦.and yet you need to cover the full marathon. 2017 was the 33rd edition of this wine-a-thon. The Medoc region in FranceÂ The Marathon du Medoc is listed in the bucket list of marathons to do before you dieâ€¦.and so after thinking about it for a few years, I registered for the 2017 edition. This is large marathon â€“ 8500 runners (sorry wine drinkers!!) and registrations sell out quite fast. 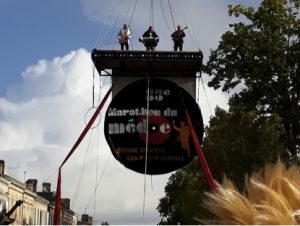 I arrived in Bordeaux on 7th September, 2 days before the run. Since I had a spare day, I met up with friends to visit beautiful St Emilion, which is an hourâ€™s drive from Bordeaux. Usually a few days before a marathon, one is careful about food, drink and rest â€“ this time I was extra careful to ensure my wine levels were well maintained!! 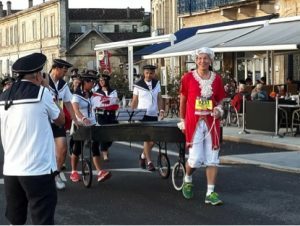 On the 8th, all runners had to go to Pauillac to collect their running numbers â€“ this was followed by (an optional) pre-race party at Chateau Livran. 1500 runners attended this party, and am sure many more would have been there if there was more space!! Having crawled into bed well past 1 AM, I woke up by 5.45 AM to grab a quick snack and then take the 6.30 bus to Pauillac. There were many sleepy eyes in the bus, but we were all looking forward to an exciting day. The Austrians who pushed the piano across the course! 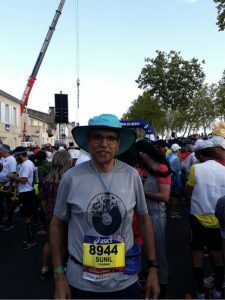 Â 2017 ThemeÂ Â One of the many highlights of the Medoc run is that each year they have a different theme and runners are expected to dress up accordingly â€“ this yearâ€™s theme was about music, and I got some friends in Bangalore to help me design and print a T-shirt and hat â€“ but when I reached the run site, I realised I was grossly underdressed â€“ the costumes were amazing, and at times it was hard to imagine how the runners would survive 42.2 km in such gear.Â The pre-race entertainment included a live band which was hoisted up by a large craneâ€¦.everybody was in a party mood â€“ were we really going to run a full marathon? 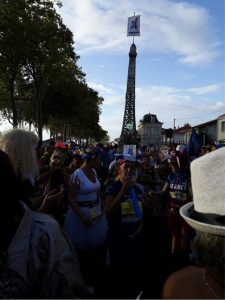 The run started promptly at 9.30 â€“ though this run is more like a carnival, it is still a professionally timed marathon and all runners have a bib with a timing chip, and timing mats at various points ensure you do not shortcut and miss the chateaus!! In addition, you need to complete the run in less than 6 hours and 30 minutes to qualify as a finisher and get a medal, otherwise, you get the marathoners dreaded DNF (Did Not Finish). The initial kilometre was through the streets of Pauillac with hundreds of cheering spectators â€“ many of the members of the crowd offered food and drinks to the runnersâ€¦as soon as we got out of Pauillac we saw our first Chateau with a refreshment stop which included good food, water, energy drinks and of course wine. I paced myself on the wine in the first few kilometresâ€¦.there was a long way to go. We soon started running through the beautiful vineyards with signages for the Chateaus which looked right out of the best-recommended wines in any Sommelierâ€™s list. Near the 4 km mark, we could see Chateau Latour on the left, and the list is endless. The band who performed before the start! The stunning route past vineyards and chateausÂ There are about 25 refreshment points spread across the chateaus on the route â€“ and the goodies included water, energy drinks, soft drinks, fancy cheeses, foie gras, oysters, cold meats etc. Each of the chateaus had made a huge effort to welcome the runners and we had live bands not just at each stop but at several other places en route. All the runners were in fine spirits, and unlike most marathons where you grab your drink and run, we all stopped leisurely at each refreshment point. Staff working at the vineyards and wineries and local residents were out in large numbers to watch us runners make a spectacle of ourselves. The rain played hide and seek with us for much of the morning â€“ but at least till the halfway point it did not get heavy. As I ran along enjoying the carnival atmosphere, it was amazing to see how effortlessly some of the other runners could carry on in their amazing costumes. The route was beautiful, but the terrain was undulating and the slippery paths running through the vineyards made for careful running (especially after many glasses of wine!!). Around the halfway point, the rain became very heavy â€“ and this along with the strong wind made it a bit chilly â€“ so I sinned terribly and missed a couple of stops. Fortunately, the rain eased in time for me to be able to enjoy the route as it crossed Chateau Mouton Rothschild and soon thereafter Chateau Lafite Rothschild. Usually, n a marathon, the 25-35 kilometre stretch is quite tough as one is tiring â€“ here we were in fine form and carried on happily for there were many more wines to sample!! Many of us were drenched and had heavy wet shoes, but did we notice?? The second half of the race was probably more enjoyable than the first â€“ maybe it had something to do with our nourishment!! Our stops became longer, we danced on the grounds as the live bands kept singing (mainly retro English songs). And we ate well â€“ in true French tradition â€“ but we knew there was more ahead so we carried on. In such happy spirits, the kilometres went by without us noticing â€“ and soon we were running on the left bank of the Gironde and then re-entering Pauillac â€“ but not without a very different refreshment stop serving delicious ice cream. Eventually I dragged myself away from this stop and ran the last kilometre to the finish line in Pauillacâ€¦..and earned the beautiful medal as I finished in 5 hours 50 minutes, which was 30 minutes faster than I planned â€“ this aberration being caused by the heavy rain which forced me to keep running and not stop at a few points around the midway mark. A medal to treasure Usually at the end of a marathon one ends up in a recovery tent with massages, hydration drips etc â€“ here we first went through a channel to get a goody bag that included a special bottle of wine, some other goodies, and a glassâ€¦.I wondered what the glass was for till I was pointed in the direction of a tent. As I entered the tent I was delighted to see the Indian flag there among many othersâ€¦.and then we entered the recovery party tentâ€¦live music, great food, lots of wine and draft beerâ€¦which is why we had been given the glass. I spent a couple of hours partyingâ€¦meeting runners from all over the worldâ€¦.it did not seem like we had run a marathon.